A sweater with balloon sleeves. Regular fit. Knitted in 100% cashmere. Cashmere is a fragile material and therefore we recommend to wash your cashmere garments after approximately every fourth use. In between, it is enough to just vent the garment in fresh air. It is ok to wash cashmere in a washing machine, use the wool programe with short wash, never more than 30 degrees. Do not centrifuge the garment. In order to protect the garment as much as possible it is best to use a special wool detergent without alkali and a laundry bag. Remember to never use fabric softener. Please note that all measurements are +/- 0,5 - 1,5 cm. Easy to wear. Easy to pair. 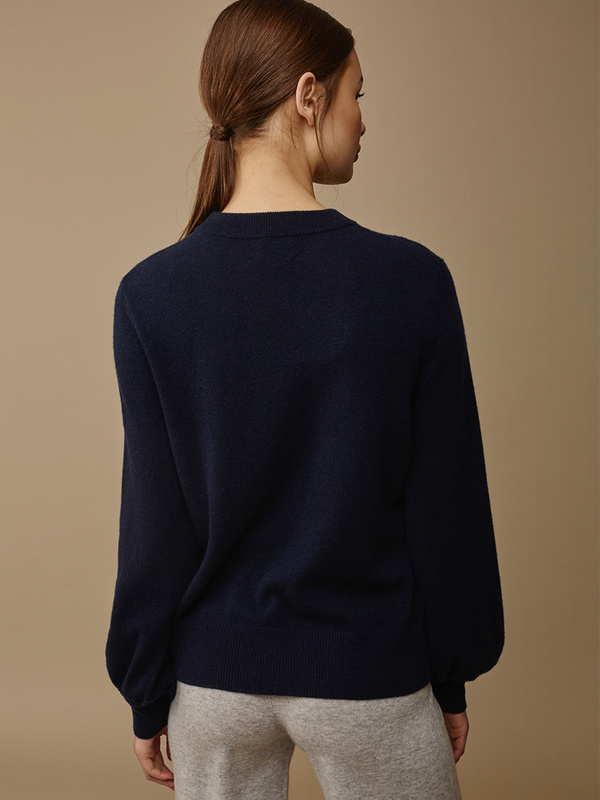 All garments at Soft Goat are knitted in 100% cashmere. Read more about our cashmere here. Cashmere is a natural material that stays warm when you need it to and breathes on warmer days. Therefore, cashmere is the perfect all-year-around-garment. It's no secret that cashmere is a soft fabric. The cashmere goats, from where cashmere come from, have an extremely warm and soft undercoat that protects them during the winter. They walk freely and are taken care of by local herders or live on farms and are taken care of by farmers. In the spring, when the goats start to shed their winter coat, they are combed or trimmed by hand to extract the downy undercoat. We have cashmere garments in chunky, ribbed, plain or cable knitted styles. Many of our cashmere garments are also available in several colours. It's really easy to wash cashmere. Choose if you want to wash it in a washing machine or by hand. Read more about cashmere care here. Wear your cashmere to work with a skirt or a pair of suitpants, at home with a pair of jeans, or with a pair of leather pants for a night out & about. Our knitted cashmere sweaters for women are knitted in 100% cashmere and are available in several models and colours. A cashmeresweater is a long lasting garment that is both warm and elegant. The woolsweaters are incredibly soft and you will definitely find some of your favourite garments among our sweaters. A knitted sweater is a must for your wardrobe.